The Daily Poem: What Makes a Hero? Refresh the soul, or set the heart at ease. Express’d in action, in endurance prov’d. One self-approval in his heart of hearts. Jay Nordlinger, NRO: Show the Shaggers! 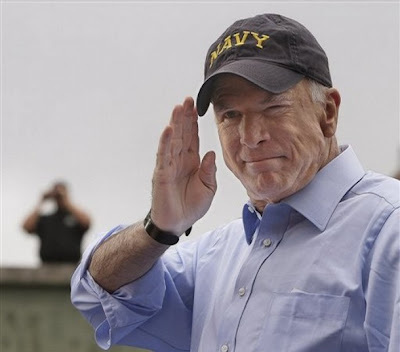 John and I have a column supporting John McCain for president that is forthcoming in Monday's Christian Science Monitor. Working on the column, it occurred to me that McCain would fit relatively comfortably in the Democratic Party of JFK, which lives on today if at all in the lonely personage of Senator McCain's friend and supporter Joe Lieberman. McCain himself seems to me beautifully captured in the almost Churchillian quote from JFK's inaugural with which we conclude our column. JFK described himself as the representative of a generation "tempered by war, disciplined by a hard and bitter peace, proud of our ancient heritage--and unwilling to witness or permit the slow undoing of those human rights to which this Nation has always been committed, and to which we are committed today at home and around the world." The John McCain of this campaign is the same as he ever was. The former Navy pilot's politics has always been more personal than ideological. His core convictions are duty, honor and country. He has always been passionate to the point of being impulsive, an unguided policy missile until he locks on target. Then he can be tenacious, and sometimes moralistic. These traits have characterized the McCain candidacy for better or worse and, we suspect, would also mark his Presidency. What the media can't say with a straight face is that they are shocked by any of this; they should admit they've simply found a new romance in Barack Obama. If the 2008 election were solely about character and experience, Mr. McCain would be winning in a walk. Reagan spent his entire life standing up to the bully. From boyhood on, he interposed himself between the bully and the innocent. He stood up to the bullies in his schools. He stood up to the Communists in Hollywood, and to the coercive unions. He stood up to the student radicals and their abettors. He stood up to the Soviets. In the world today are a lot of bullies to stand up to: al-Qaeda, the mullahs, the North Koreans, the Chinese Communists, the Castro brothers, Chávez. John McCain will almost certainly do it. Barack Obama will almost certainly not. That’s one reason — probably the biggest reason — I’m voting for McCain on Tuesday.